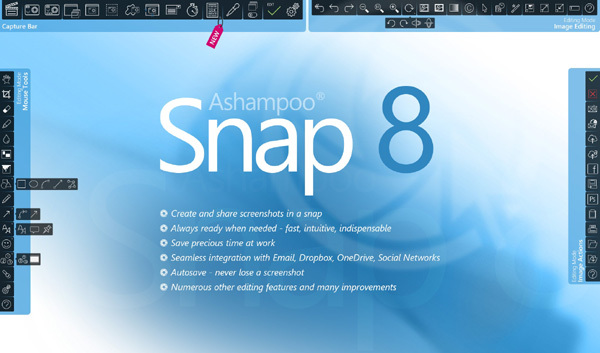 Free download Ashampoo Snap latest version.Ashampoo Snap enables users to capture with pixel perfect accuracy, edit and share screen contents either as single images or videos. The application comes with powerful image editing capabilities. Ashampoo Snap offers unlimited possibilities. Create your own video tutorials and video-capture your webcam, Skype calls or streams with ease! The new capture controls allow you to pause your videos, add effects or apply timer-based time restrictions. Ashampoo Snap fully supports huge 4k resolutions and multi monitor environments! Record all of your screens or make a selection and optionally resize your video on the fly to save space.Protect your images with water marks to prevent against theft and misuse. Use anything from discreetly placed transparent texts to a massive copyright symbol. Capturing menus and drop down lists has always been a nearly impossible task since they disappear the moment you use your mouse or keyboard. Ashampoo Snap comes with a special capture mode that allows you to capture these elements. Indispensable for technical documentation!